The year opens in the name of the Mother of God. Mother of God is the most important title of Our Lady. But we might ask why we say Mother of God, and not Mother of Jesus. In the past some wanted to be content simply with the latter, but the Church has declared that Mary is the Mother of God. We should be grateful, because these words contain a magnificent truth about God and about ourselves. From the moment that our Lord became incarnate in Mary, and for all time, he took on our humanity. There is no longer God without man; the flesh Jesus took from his Mother is our own, now and for all eternity. To call Mary the Mother of God reminds us of this: God is close to humanity, even as a child is close to the mother who bears him in her womb. The word mother (mater) is related to the word matter. In his Mother, the God of heaven, the infinite God, made himself small, he became matter, not only to be with us but also to be like us. This is the miracle, the great novelty! Man is no longer alone; no more an orphan, but forever a child. The year opens with this novelty. And we proclaim it by saying: Mother of God! Ours is the joy of knowing that our solitude has ended. It is the beauty of knowing that we are beloved children, of knowing that this childhood of ours can never be taken away from us. It is to see a reflection of ourselves in the frail and infant God resting in his mother’s arms, and to realize that humanity is precious and sacred to the Lord. Henceforth, to serve human life is to serve God. All life, from life in the mother’s womb to that of the elderly, the suffering and the sick, and to that of the troublesome and even repellent, is to be welcomed, loved and helped. Let us now be guided by today’s Gospel. Only one thing is said about the Mother of God: “Mary kept all these things, pondering them in her heart” (Lk 2:19). She kept them. She simply kept; Mary does not speak. The Gospel does not report a single word of hers in the entire account of Christmas. Here too, the Mother is one with her Son: Jesus is an “infant”, a child “unable to speak”. The Word of God, who “long ago spoke in many and various ways” (Heb 1:1), now, in the “fullness of time” (Gal 4:4), is silent. The God before whom all fall silent is himself a speechless child. His Majesty is without words; his mystery of love is revealed in lowliness. This silence and lowliness is the language of his kingship. His Mother joins her Son and keeps these things in silence. That silence tells us that, if we would “keep” ourselves, we need silence. We need to remain silent as we gaze upon the crib. Pondering the crib, we discover anew that we are loved; we savour the real meaning of life. As we look on in silence, we let Jesus speak to our heart. His lowliness lays low our pride; his poverty challenges our outward display; his tender love touches our hardened hearts. To set aside a moment of silence each day to be with God is to “keep” our soul; it is to “keep” our freedom from being corroded by the banality of consumerism, the blare of commercials, the stream of empty words and the overpowering waves of empty chatter and loud shouting. The Gospel goes on to say that Mary kept all these things, pondering them in her heart. What were these things? They were joys and sorrows. On the one hand, the birth of Jesus, the love of Joseph, the visit of the shepherds, that radiant night. But on the other, an uncertain future, homelessness “because there was no place for them in the inn” (Lk 2:7), the desolation of rejection, the disappointment of having to give birth to Jesus in a stable. Hopes and worries, light and darkness: all these things dwelt in the heart of Mary. What did she do? She pondered them, that is to say she dwelt on them, with God, in her heart. She held nothing back; she locked nothing within out of self-pity or resentment. Instead, she gave everything over to God. That is how she “kept” those things. We “keep” things when we hand them over: by not letting our lives become prey to fear, distress or superstition, by not closing our hearts or trying to forget, but by turning everything into a dialogue with God. God, who keeps us in his heart, then comes to dwell in our lives. These, then, are the secrets of the Mother of God: silently treasuring all things and bringing them to God. And this took place, the Gospel concludes, in her heart. The heart makes us look to the core of the person, his or her affections and life. At the beginning of the year, we too, as Christians on our pilgrim way, feel the need to set out anew from the centre, to leave behind the burdens of the past and to start over from the things that really matter. Today, we have before us the point of departure: the Mother of God. For Mary is what God wants us to be, what he wants his Church to be: a Mother who is tender and lowly, poor in material goods and rich in love, free of sin and united to Jesus, keeping God in our hearts and our neighbour in our lives. To set out anew, let us look to our Mother. In her heart beats the heart of the Church. 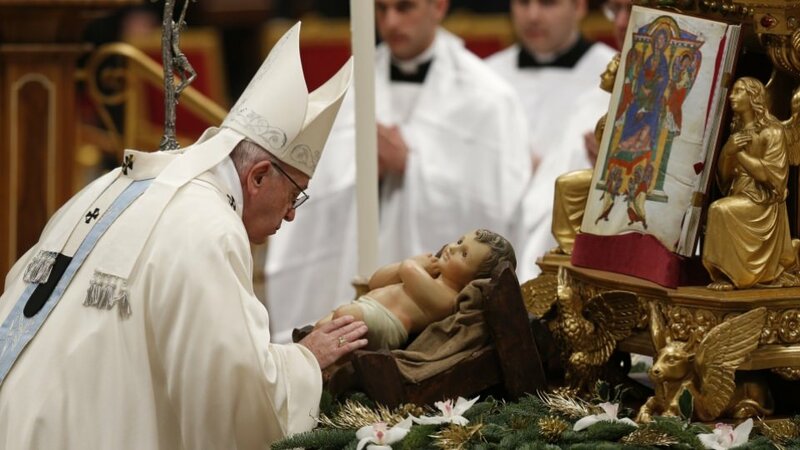 Today’s feast tells us that if we want to go forward, we need to turn back: to begin anew from the crib, from the Mother who holds God in her arms. Devotion to Mary is not spiritual etiquette; it is a requirement of the Christian life. Looking to the Mother, we are asked to leave behind all sorts of useless baggage and to rediscover what really matters. The gift of the Mother, the gift of every mother and every woman, is most precious for the Church, for she too is mother and woman. While a man often abstracts, affirms and imposes ideas, a woman, a mother, knows how to “keep”, to put things together in her heart, to give life. If our faith is not to be reduced merely to an idea or a doctrine, all of us need a mother’s heart, one which knows how to keep the tender love of God and to feel the heartbeat of all around us. May the Mother, God’s finest human creation, guard and keep this year, and bring the peace of her Son to our hearts and to our world. And as children, with simplicity, I invite you to greet her as the Christians did at Ephesus in the presence of their bishops: “Holy Mother of God!”. Let us together repeat three times, looking at her [turning to the Statue of Our Lady beside the altar]: “Holy Mother of God!”.